Trinfinity8® represents a new quantum shift in the emerging science of algorithmic technology for rejuvenation and health. This unique software program was developed as a direct result of information brought back from a near death experience by Dr. Kathy Forti. 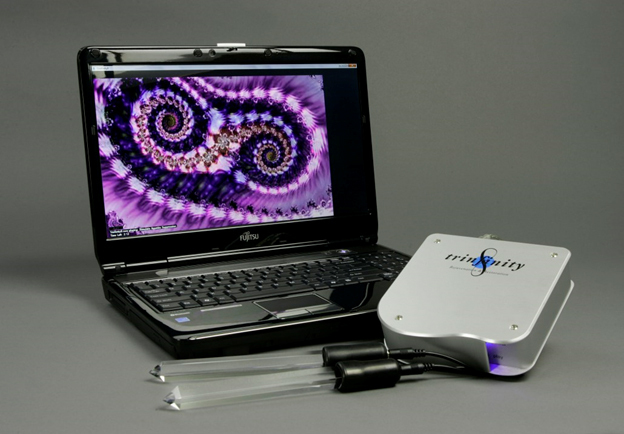 Trinfinity8® is the first system of its kind to use a personal computer to deliver non-invasive rejuvenation programs based on mathematical codes, vibrational energies, and fractal formulations that are in harmony with core energetics that encompass all of nature. Trinfinity8 uses pure quartz crystal rods to directly deliver information to the body in a language it understands—math. Trinfinity8® is designed to help increase awareness and to assist the individual in attaining a state of self-balance while working to help restore vitality.